"There is nothing permanent except change." This was stated nearly 2500 years ago by Heraclitus, an ancient Greek philosopher. What is change? Change occurs when a situation ends and something new or different starts. Our journal has undergone a change. A change in editor-the old giving way to the new. My predecessors, Dr. Venkataram Mysore and Dr. Somesh Gupta, have done an excellent job in establishing the journal. I hope, as the editor-in-chief, to usher in some newer formats in the journal which will take the journal to the next level. The new feature Video Online will help the younger generation to inculcate newer procedures and techniques. The cameo on Innovation can be a game changer which can change the way you practice. The feature Practice Points will have experienced professionals giving advice on how to handle the complexities of a surgical and an aesthetic practice. Ethical Hotline will feature medicolegal issues, which every practitioner must know. Articles in the section Bridging the Gap will include articles and studies from other specialities that help in cross-speciality management. One has to learn to let go of the old and embrace the new. Our young editorial team and dynamic editorial board will take us smoothly through this change with their enthusiasm and experience. The dynamics of change is governed by three processes. The first is unfreezing of status quo, followed by a set of actions processing the change and then refreezing of a stable pattern, till the next cycle of change. New ways replace the old and become standard practice. Nowhere is it more evident than in the changing practice of medicine. Our CME article on hemangiomas exemplifies this principle. The approach to the management of hemangiomas has undergone a sea change, since the serendipitous discovery of efficacy of propranolol in hemangiomas in 2008. The beta blockers, oral and topical, have now become the first line of treatment for hemangiomas, replacing corticosteroids. Vascular lasers are newer tools in management. Similarly, treatment of other lesions, such as angiofibromas and neurofibromas are changing and awaiting results of trials with mTOR inhibitors such as sirolimus. 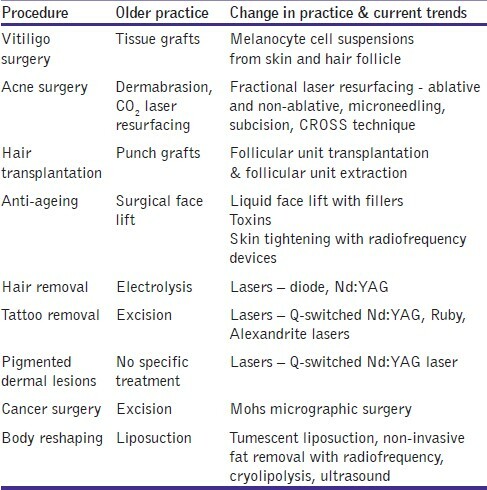 , Older examples of drastic changes in cutaneous and aesthetic practice include the advent of lasers for hair removal, treatment of pigmented lesions such as nevus of Ota and tattoos with Q-switched Nd:YAG lasers, and the pulsed dye laser and endovenous laser and radiofrequency for the treatment of vascular lesions. The practice of rejuvenation and approach to ageing has changed dramatically from traditional invasive face lifts to minimally invasive toxins and fillers called as liquid face lifts. Radiofrequency energy has entered in a big way. Fractional treatment has made these technologies safer and patient-friendly. Some of the practice changes are highlighted in [Table 1]. The power of change can help us to improve personally as well as empower the community and the world at large. Incidentally, the world's largest democracy India has also voted for change. Change for a dynamic and powerful leader. An ideal leader creates a vision of how things can be changed, translates this vision into visible agenda, communicates the agenda and then persists till the agenda gets accomplished. Change can be a powerful tool. Change is a constant phenomenon. 1. Sethuraman G, Yenamandra VK, Gupta V. MManagement of Infantile hemangiomas: Current Trends. J Cutan Aesthet Surg 2014;7:75-85. 3. Franz DN, Weiss BD. Molecular therapies for tuberous sclerosis and neurofibromatosis. Curr Neurol Neurosci Rep 2012; 12: 294-301. 4. Tanaka M, Wataya-Kaneda M, Nakamura A, Matsumoto S, Katayama I. First left-right comparative study of topical rapamycin vs. vehicle for facial angiofibromas in patients with tuberous sclerosis complex. Br J Dermatol 2013;169:1314-8.